Korg Kronos Volume #1 – Vintage Synths – Our first collection of sounds for the Kronos HD-1 Sound Engine is now available! An amazing assortment of fully KARMA-fied Programs & Combis perfect for producers and keyboard players looking for some great classic synth sounds to add to their new Korg Kronos. The Patch King has now tapped into his collection of vintage synths and has sampled a wide mix of sounds from six classic analog synthesizers. Cool new sounds from the ARP2600, Mini Moog & Moog Modular, Roland Super Jupiter/ MKS80, Sequential Prophet VS Rack & Prophet 5 and tape sounds from the Mellotron. Also included in the collection are several new multi samples from our MOSS sound libraries. 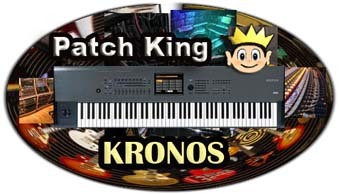 Kronos Vintage Synths contains 64 programs, 32 Combis and over 250 MB of new multi samples with a wide assortment of analog basses, leads, pads, strings and killer synth sounds that have that vintage analog sound that many musicians pay big bucks for. NOW ONLY $60. USD.